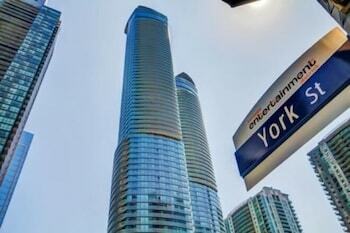 Expedia can help you save with a Toronto holiday package. With all that extra cash in the bank, you might even like to lock in a few more nights. By securing a package deal on Expedia, you can save up to 16%*. Pick from more than 400 partner airlines and 321,000 worldwide properties via our global database of flights and lodgings. Fly with who you want, stay where you want — now that's the ideal holiday! You can delay your holiday plans with us because we don't charge cancellation fees for almost all of our reservations. It's enjoyable to just wander the streets in a new place, but sometimes it's sensible to make a plan. Grab your schedule — we have loads of wonderful ideas for your impending Toronto holiday. Home to attractions like the University of Toronto - St. George Campus and the Hockey Hall of Fame, there will never be a boring moment in this dynamic city. Once you're done checking out those, push ahead to Casa Loma and the Royal Ontario Museum. Check out the events guide at Medieval Times for a variety of fantastic shows and productions. There's a fabulous range of things to do in this destination. Stand-up comedy can be hit and miss, but few things are like the excitement of a live crowd when comedians nail their gags. Head to Second City and get set for a good belly laugh! Still got time on your hands? Rainy afternoons are a brilliant opportunity to sink your teeth into a good book in quiet surrounds. So, if it looks like it's going to bucket down, why not rush over to Toronto Public Library and check out the latest fiction? The world is brimming with adventure, and there are countless extraordinary experiences to be had when we dig out our passports and go on holiday. For a full range of options, take a look at our Toronto things to do page. Seeking out luxury getaways or cheap holidays in the provincial capital? If so, you'll need to find somewhere to rest your head. 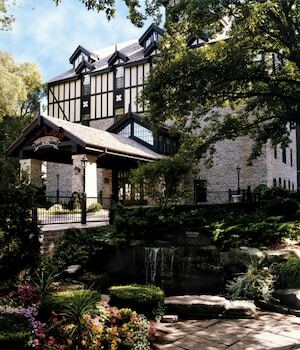 With no less than 331 properties in Toronto, you won't have to look too hard! After a long-haul flight, there's nothing more pleasant than putting your feet up in a flashy room and treating yourself to some room service. See what delicious treats await you at The Ritz-Carlton, Toronto (181 Wellington St W) or The Hazelton Hotel Toronto (118 Yorkville Ave). The Four Seasons Hotel Toronto (60 Yorkville Avenue) and the Pimblett's Downtown Toronto B&B (242 Gerrard Street East) both have good guest ratings if you're after something more economical. Booked those plane tickets for your trip to Toronto yet? When you arrive, get ready to step out into Pearson International Airport (YYZ). It's 12 miles (19 km) from here to the downtown area. 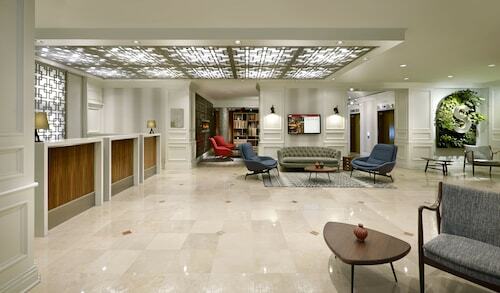 Located in Financial District, this romantic hotel is steps away from The Path and PATH Underground Shopping Mall. Hockey Hall of Fame and Sony Centre for the Performing Arts are also within 5 minutes. King Station is only a 2-minute walk and Queen Station is 6 minutes. 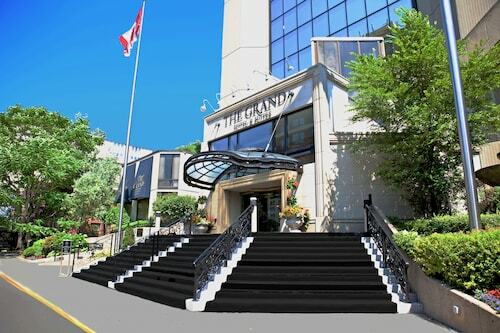 This family-friendly Toronto hotel is located in the historical district, within a 10-minute walk of Hockey Hall of Fame and Scotiabank Arena. CN Tower and Rogers Centre are also within 15 minutes. Toronto Union Station is only a 3-minute walk and St Andrew Station is 6 minutes. This family-friendly Toronto hotel is located in the entertainment district, within a 10-minute walk of Yonge-Dundas Square, Toronto Eaton Centre and Toronto City Hall. Art Gallery of Ontario and Hockey Hall of Fame are also within 1 mi (2 km). College Station is 5 minutes by foot and Dundas Station is 5 minutes. 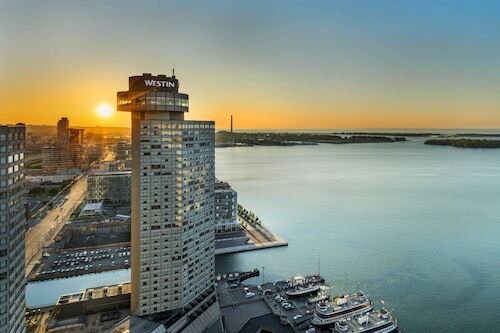 Located in Downtown Toronto, this romantic hotel is within a 10-minute walk of PATH Underground Shopping Mall, Scotiabank Arena, and Harbourfront Centre. Hockey Hall of Fame and Ripley's Aquarium of Canada are also within 15 minutes. King Station is 14 minutes by foot and Toronto Union Station is 14 minutes. 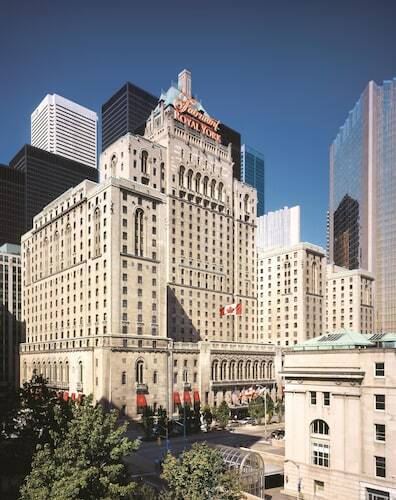 Located in Downtown Toronto, this spa hotel is within 1 mi (2 km) of Ryerson University, Hockey Hall of Fame and Scotiabank Arena. The Distillery Historic District and University of Toronto - St. George Campus are also within 2 mi (3 km). Dundas Station is 8 minutes by foot and Queen Station is 10 minutes. 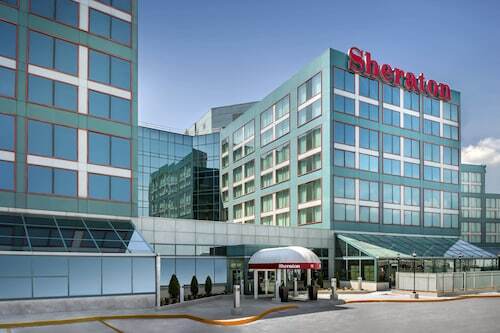 Situated near the airport, this eco-friendly hotel is 1.9 mi (3 km) from The International Centre and 2.8 mi (4.5 km) from Toronto Congress Centre. Woodbine Racetrack and Centennial Park are also within 6 miles (10 km). Terminal Link Terminal 3 Station is only a 1-minute walk. Located in Financial District, this eco-friendly hotel is steps away from The Path and PATH Underground Shopping Mall. Metro Toronto Convention Centre and Hockey Hall of Fame are also within 10 minutes. St Andrew Station and Toronto Union Station are within a 5-minute walk. 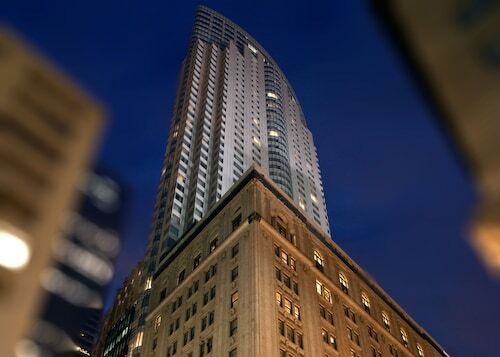 Located in Toronto Entertainment District, this eco-friendly hotel is steps away from The Path and TIFF Bell Lightbox. Princess of Wales Theatre and PATH Underground Shopping Mall are also within 5 minutes. St Andrew Station is 8 minutes by foot and Osgoode Station is 12 minutes.